Before he took on the great stage name of Kris Demeanor, this songwriter/spoken word artist put out a couple of releases with his sister Monika and percussionist Ron Burland. This is a nice little preview of things to come; Kris' voice sounds younger, his delivery perhaps isn's as assured as it is now, but the songs are definitely coming from the same place - lots of quirky storytelling, driven by Kris' sometimes manic acoustic guitar. We're not sure of the year on this - we're guessing at 1995 (their CD came out in 1996). We're pretty sure the cover art is by Ian Doig, though. Also, our hand-delivered copy of FFWD arrived late this week. 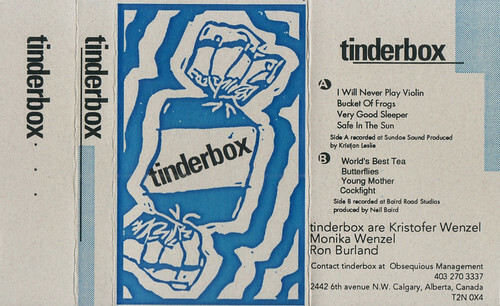 We just noticed that Tinderbox will be playing that CJSW 25th anniversary show we're so excited about. This was the first tape I ever bought at Calgary Folk Fest. It was lost in my parent's messy divorce, but it was the soundtrack to many seminal moments in my teenage years. I thought I'd never have it back.